Recreational anglers today (Monday) urged the fisheries minister, Jonathan Shaw, to reconsider his controversial plans to make them buy licenses to fish in the sea. The minister met a delegation led by Richard Ferr�, chairman of the National Federation of Sea Anglers (NFSA), and David Rowe, its chief executive, at Penzance pier during a visit to the fishing industry in the region. The meeting was arranged by the NFSA at the minister’s request and included charter boat skippers who take anglers to sea, owners of fishing tackle businesses and anglers who fish from the shore or from their from own boats. The fishing tackle and charter business owners told the minister that much of their trade came from holidaymakers. If they had to buy a license to go fishing for a day their trade would be lost. Mr. Shaw also watched an NFSA coach giving practical instruction on the pier to a group of young anglers. Mr. Ferr� explained to the minister that there was little support for a license because years of carefree commercial overfishing permitted by the present and previous governments had so damaged fishstocks that anglers seldom caught specimens anymore and any fish they did catch were often too small to take home. He urged the minister to legislate to protect the run down fishstocks so they would regenerate and recover to the point where they would benefit both sea angling and commercial fishing. The proposal for a sea angling rod license is expected to be included in government’s draft Marine Bill next month. The NFSA believes that such a scheme would not generate enough cash to allow any to be reinvested in developing sea angling. Mr. Ferr� thanked the minister for spending more than an hour listening to and discussing, the problems of sea angling. The NFSA , he said, looked forward to continuing to work with him and his officials to solve the problems of both licensing and the devastated fishstocks in coastal waters. A meeting has been arranged with Defra on Monday 25th February 2008. The meeting will take place at the NFSA head Office at Buckfastleigh at 7pm. We would like Sea Anglers from the South West to meet Defra to talk and discuss the recent released Consultation on a Recreational Sea Angling (RSA) Strategy for England Document. This is a very important document which can be looked up at Defra website www.defra.gov.uk and all RSA should send in their responses by 31 st March 2008. The purpose of this meeting would be to help anglers prepare their responses and or to ask any questions they might have to Defra. Please can I ask, that if you are or know of any interested parties who would like to attend this meeting, to contact David Rowe at the NFSA Head Office on 01364 644643 or E Mail dr@nfsa.org.uk We would like to get some feel for numbers for this date, so please reply promptly. Around 80 members turned out for the clubs Annual Presentation Night, up on previous years. 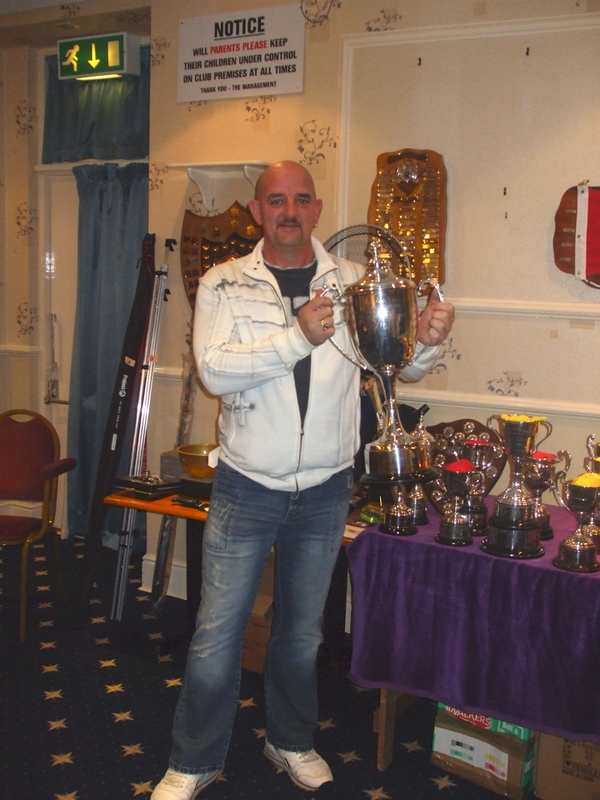 Around 100 Trophies were presented by Tim Bird the Fishing Chairman and Stan Rowe from the Herald Express during the evening. Fred Parnell taking Best Specimen Overall. Around 60 members turned out for the clubs AGM. Please see committee members section for the elected officers. Officers elected: President - B Heaven; Chairman - S Holgate; Vice Chair and Bar Chairman - R Shailes; Secretary - L Harding; Assistant - Diana Wherlock; Treasurer - P Wright; Fishing Chairman - M Wall; Entertainments - B Amer; Maintenance - vacant; Minute Clerk - P Passmore; Management Committee - T Berry, A Lake, B Coombes, R Scott, two vacancies; Bar Committee - R Anders, S O'Gorman, J Guthrie.Those who attended were welcomed by club president Brian Heaven as he opened the evening. He said he was pleased to see a small increase in attendance, but his opening remarks were similar to those of 2007, when nominations for some posts were unfilled. A club of this size should have, and needed, a full list of those keen enough to help keep the organisation up and running smoothly. He thanked those who had worked in all sections through the year and especially those who had taken on entertainments, for they had been popular. Chairman Steve Holgate then made his report, again thanking all those who had worked to give members one of the best angling clubs in the South West. There had been a slight setback over efforts to provide an outdoor smoking area for members, as the planning application for a covered terrace at the rear had been refused, though this matter is to be discussed later. Treasurer Jane Parker gave a report on the balance sheet, noting there had been a slight drop in overall funds, but this could be explained by the effect of the national smoking ban, and also there was little chance of a drop in prices generally. Questions were asked on some figures but these could be answered by the fact that auditors had to have figures early and some items had not been entered. All would be looked into and the management informed. Secretary Les Harding said there were 54 card holders at the meeting, but the annual figures showed anglers at 380, social 300, with sporting, junior and life members taking the total to 780. He thanked those who had put the club news on the website and recommended all to use the system - a monitor will be installed in the committee room shortly for this purpose. He thanked the bar staff and helpers for their work through 2007. Fishing chairman Tim Bird was next to speak, giving his report on the year's success. 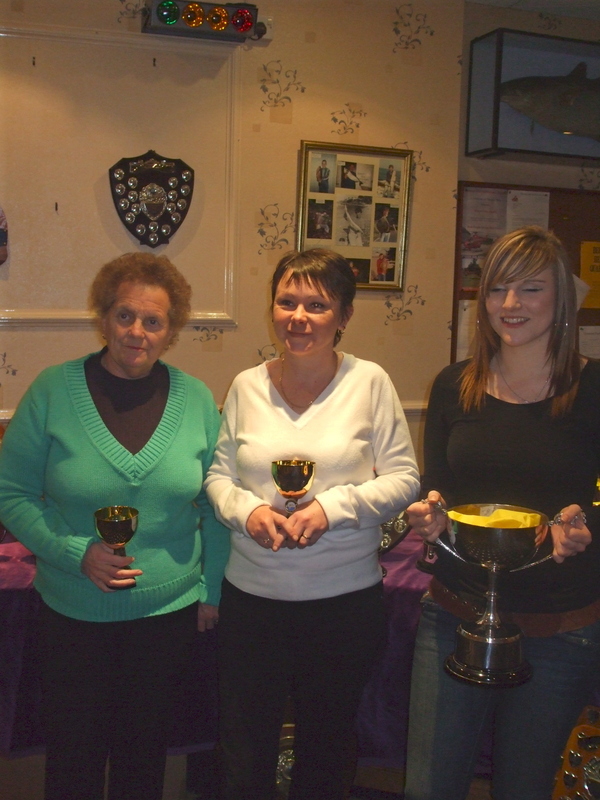 The club had received good sponsorship for their various open events, and the RNLI had received �1,000 for their funds. 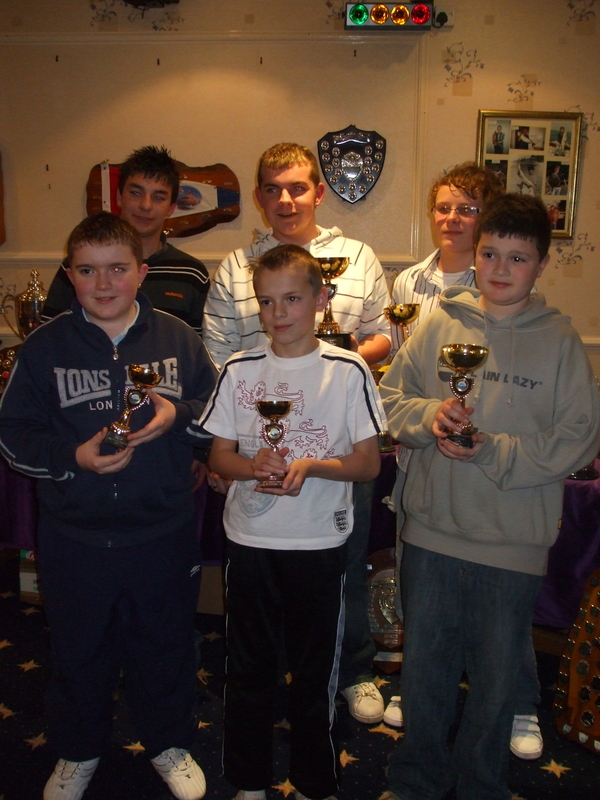 The club had won the Torbay Shield as well as many festival awards, and many club records had been set or broken. He also thanked B Amer and P Wright for their support with activities. He said that after four years he was standing down, but that Mike Wall had been nominated for the post. Fish recorder Tom Underwood said it had been a very good year - almost 800 fish had been recorded, with 162 NFSA specimens and 202 at PSAA weights. Analysis showed that catches afloat and from shore were almost equal, with 14 new records, eight ladies, two junior and four seniors had been set across the species. He said there was a need for more juniors within the club, and as a help to claims a monthly list of best fish for named trophies would be displayed. He thanked Clive Star and Barry Amer for their computer work, a great help in many ways. Barry Amer, for entertainments, said that most of the events organised had been well supported. However, one or two had been slow and there had been very little interest in the annual dinner/dance and it had been cancelled. A programme of events had been arranged, all would be shown on the notice board in good time. The election of officers and management committee followed, with a few positions unfilled. The one listed proposal was then discussed: "That a fresh water angling section be formed within the club, providing that the member had an EA Angling Licence." Thrown open to the floor there was quite a discussion, with the stalwarts saying that the club was a 'sea angling' group, while others said that already several members followed both disciplines. It was proposed that the wording of the motion be amended to hold 'an annual EA Licence'. Put to the floor this was accepted 44 to four, and the main proposal that the committee look into putting the section into operation for 2009 was passed 38 to four. In AOB the patio was discussed, the refusal was based on Roundham being a conservation area and the effect the area might have on neighbours. After a discussion the chairman was empowered to look into an appeal, depending on cost. It was mentioned that the 'Vision for the Bay' seemed to include high-rise blocks within a close distance of the clubhouse. T Underwood will continue as records officer, and the post of cup custodian was filled by Greg Paull following the retirement of Rebecca Wherlock due to work commitments. The meeting with DEFRA arranged by the NFSA and the Wyvern Division at their Buckfastleigh HQ attracted more than 50 anglers to hear what Trevour Hutchins and Nicola Clarke had to say about the consultation paper called, Recreational Sea Angling Strategy. It was a very robust meeting where anglers said in no uncertain terms that bringing in a licence, that is included in the document, would not be accepted without cast iron guarantees that the money raised would be used to better angling. Surprisingly the majority said they would support a licence if such guarantees were in place. The annual licence would probably cost in the region of �15 each. There was a great debate on bass as you would expect as well as on other species. "We want bigger fish" was the message. Trevour Hutchings said that many options were under consideration, and those included possibly having RSA areas only and, maybe selected species for RSA only, as is about to happen with the tope. It was a long meeting that started at 7.30 and had to be closed with still questions to answer at 10.45 as many of the anglers attending had travelled long distances from Cornwall, Dorset, Somerset and North Devon.